When my wife and I moved to Montana, we found a comfortable home on several acres with a view of the mountains. There was only one hitch – the house was off the grid. In fact, everyone in the subdivision generated their own power, including the bed and breakfast nearby. That doesn’t mean it was primitive. The house had solar panels, a wind turbine, a battery bank and inverter, a generator, and a full range of appliances including washer and dryer, refrigerator, stove, satellite TV, propane furnace, and even a dishwasher. Since I had operated a cogeneration power plant before coming to Montana, I wasn’t too concerned about generating my own electric power, so we bought the house. The previous owner showed me the critical facilities and told me how to operate them. When we moved in we put CFLs (compact fluorescent lights) in every light socket, programmed the thermostat to automatically lower the temperature at night, and made sure to turn off the lights when we left a room. We thought we had everything under control. On our third night in the house, we went to bed as usual to the faint sound of wind outside, a sound we were already beginning to enjoy because it generated most of our power. In the middle of the night, I was awakened by the sound of – nothing. No hum of the refrigerator, no furnace fan, and no wind. The tiny power light on the carbon monoxide detector was out, as was the digital display on the clock radio. We had no power. I got up and went outside to check the power equipment. Apparently the wind had died during the night and the small amount of power in use had drained the batteries. I started the gasoline generator and it began providing power to our house and recharging the batteries. I had just learned the first lesson of wind and solar power: they can’t always be counted on when you need them. No matter where you are, the sun will always set and the wind will stop blowing. You have shared a nice post. I really appreciate the efforts you have made. You have conducted a thorough research and written a great post. Keep up the good work! Most of my life i was always patient and very cautious so the techniques i implemented that dont require wind or solar made me think am i the only one that has thought of it? now how determan drive montor is 1/3 of that + 20% . Ever heard about air conditioning? It runs on electricity. Electricity provided by modern generators, which you can recharge and isolate so that the sound doesn’t create an issue. Water? Well you need a water source. The filtration is quite simple. There are also bio-electrical solutions. Inform yourself, if there is a time left between the bills. Off the grid? You cannot go off the grid, but you can try to create your own. Your forgetting that you are living in an area where there is NO power and requesting that the local utility company connect you to the grid would cost thousands for sure. Why bother having a wind and solar panel at a combined output of 2 KW when you could just buy another inverter at $3000 and save $3700 and have an extra 2KW of power. Have you thought of drying your clothes in the sun? Dryers usually are the main culprit for high electrical bills as well as hot water. Good luck anyways…I hope to be in the same situation myself. For water supply, do you have a well? A formula for primes? Really? Wonder why the world hasn’t seen it. off grid for 4 yrs. was going to cost $15000 just to get on grid. We have everything like a normal home,satelite internet,etc. about $8000 into solar and batteries,inverter. can go 5-10 days without sunshine before starting gen set for a few hrs. finding efficencies is cheaper than making and storing more power. grew up on a farm. lack of common sense, ignorant ppl if you cant figure it out… educate yourselves a lil ppl! instead of being lazy,expecting to throw money at the problem and finding faults,blaming others. all with my own hands this has been accomplished with a hs education and educating myself. Sorry, but original author ,just another ignorant american consumer! Once when driving north of Amsterdam my mother pointed out to me an old farmhouse where her grandparents used to live. Next to the house you could see what appeard to be a small ‘iglo’ type construction. It was the cover over a sewer tank right next to the house. From the top of the ‘iglo’ run a copper pipe into the kitchen. She told me that even in the 19th C her grand parents had a ‘never ending’ supply of methan gas sufficient to do all the cooking for the farm. Live in the country w/175′ deep well for house and garden water. Elect. deep well pump. Purchased whole house generator, fuel source 1,000 gallon propane tank dedicated to the generator. the cost of the tank to rent was $100.00 a year and propane is the cheapest it has been in years, just like gasoline. Propane stores well while gasoline doesn’t, something to consider for extended off grid timeframe. The generator is outside and will only be used two hours a day to electrify in house needs and power the well pump. purchased a wood burning furnace that ties into my propane house furnace, which has its own 500 gallon propane tank, which will heat a 2400 square foot house without the current furnace operating. I do have a neighbor who has provided me with all the hardwood trees I care to cut and store for the furnace. I am building a two year, fall, winter and spring supply of wood. If you don’t have a wood source, wood can be purchased and saved for emergencies. When we purchase our groceries we buy additional goods for storage. Belonging to Cosco facilitates large lot purchases at a cheaper cost than grocery stores. I feel we are getting prepared for the worst and hope it’s all been a waste of time and money. Total amount invested approximately $12,000.00 which includes $2,000.00 for a certified electrician to wire the generator. The most negative aspect of this entire operation is the requirement to be prepared to protect it. I believe when the time comes to sell the property, not planning on doing this soon, believe I will be able to recoup at least half of my investment in these survival items. I have two daughters, two son-in-laws and four grand children I am preparing to shelter, feed and protect if the worst case scinero should come about. What about magnetic motor energy, does every one forget Tesla? Off the grid or not? I would like to bring forward a concept of the corporate opinion. If you pay $100 every month for a service that’s invested to profit 12-15% over a 30 year duration for your phones, TV, car insurance or utility, each account is worth $1,280,000 to the company you are submitting these payments. If I invest in off-grid power and get the 12-15% return on my investment for the life of the system, who is the smart investor… The stock market may be exciting on thee way up, but when your neighbors have a power outage due to storm damage in your town, life of independence is priceless. I started small with identification of the wasted power alliances, like the 15 year old electric clothes dryer I REPLACED with gas, and saved $40 a month. Removed old VCR players and changed all 75-100 watt light bulbs out with 5-watt LED bulbs at Walmart. The twisty CFL bulbs were dull and not natural bright light, and saved another $20 on the bill. With my power usage meter, I founded the water bed in the spare bedroom was another $30 to maintain, so I learn to switch it off. Then the bigger items that can’t be changed, like water well and heat pump systems. I purchased and installed the “Power saver 1200” Power factor capacitor that off loads the higher cost of 220V starting loads of electric motors. Each application saves 20-30% of the previous electrical usage. My $250-300 monthly bill was cut in half just by reducing the waste in a few consumer electrical items. Now I know what power I need to produce off-grid. See my You-tube “yourhandyman100” video’s. I started with a grid-tied wind power and have grown to the 40kw-battery storage and 12Kw inverter-charger switching from grid power and off-grid automatically. If you have a smart meter on your house get the free phone application and check your homes daily electrical use. Do you check the weather on your phone? Check your electrical meter, too… I went from 80-110/day to 20-55/day with a few upgrades and elimination of the evil power drains on my budget. Hello, I have invented a system that will furnish ac and dc from a 4 head unigenerator. will produce over 1000 volts of ac every 1/2 second, over 1260 volts dc per 1/2 second. I Have been trying for 4 years to find a investor that doesn’t want to steal the technology. I am a semi-retired Physicist. This generated electricity runs off of a 12 volt low amp motor. What is generated a part goes back to keep the battery charged. I developed this 25 years ago. To be very practical, I would suggest a combination of technologies, like isolated solar appliances (each having its own solar panel),a hand wound spring driven table fan, li ion batteries for most equipment, a hand pump for water, 14 kg propane cylinder for cooking, evaporative earthen vessels for cooling water and vegetables, miniature TV and 2g cell phone for internet, 12 volt bldc fans to run directly from panel or battery without using inverter, etc. just wondering what would a person do in the winter if they wanted to go away for a week somewhere, are you emptying your fridge and freezer? Are your pipes going to freeze if your power supply is used up? Certainly no one will be there to start the generator. I think this could be very dangerous and costly, I know I wouldn’t trust this approach. I would want to still be hooked to power company, but then you would still get a monthly bill for administration, getting the power to us. In Alberta we pay about $50-$75 per month in fees just to get the power to us and then are charged for the power we use. In most cases I pay more to get the power to me than I do for the actual electricity amount that I use. Just saying!!!! Off the grid CAN be cheap if you’re willing to make one or two “little” lifestyle adjustments. We live in Amish country. Now THEY are off the grid – kerosene or oil lamps, wood or coal heat, horses and buggies. “No phone, no lights, no motor car….” Our token adjustments to a simpler life is doing lots of canning and making our own soap, giving up TV and living in a cabin. We are looking at building a new home. While power lines do exist along the county road, we would have to pay quit a sum to have them linked thru the woods to the location of our new home. The same with gas lines, which would be quite a bit more since it’s a highly wooded lot. I am thinking of a solar/wind power combo with wood and oil heat. The hot water on demand has me interested as well. Where can I find a yearly cost to maintain solar/wind power? Replacement batteries, general maintenance, etc. how about this alternative for roof mounted solar panels – reduces upfront cost. I live in Tokyo on the grid. But our house is about 750sqft. Very small by US standards but then again the city is our living room and parks our back yard. We use an on demand water heater which I highly recommend. After using this I cannot echo the sentiments of insulating old style water heaters all day and night for hot water you’re not using. We do it here for space saving as well. What about hydrogen? They have some people using it here in Japan- the Japanese companies have relatively affordable units for consumers. Sorry but you don’t need a dryer- it takes a little getting used to but we hang our laundry inside during the winter and it dries within a few hours because the air is dry and it acts as a humidifier. I hated it at first and sometimes its a pain if you need something quick. Maybe you can try every other load? Cut the energy in half. Top 3 energy suckers- heating, air conditioning, refrigerator and hot water heater? i believe. We also use room heaters and air conditioners- may not work there. The bad about Japanese housing- we live in an old house -40 years- single pain windows! no floor or ceiling insulation! All in all our electricity, gas, and water bills hover around $100 US each a month. ANYONE TRYING TO LIVE OFF GRID IN SUBURBIA USUALLY IS NOT GOING TO HAVE THE REAL ESTATE TO PULL IT OFF. IT ALSO DEPENDS WHERE YOU LIVE. YOU CAN SEARCH ONLINE AND FIND SOLAR AND WIND CHARTS CREATED BY THE GOV. THESE CHARTS WILL TELL YOU IF YOU HAVE A HIGH ENOUGH SUN OR WIND % TO MAKE OFF GRID POSSIBLE WITHOUT HUGE EQUIPMENT. WHERE I LIVE I DON’T HAVE EITHER AND IT WOULD BE A WASTE OF MONEY. IT WOULD TAKE TWICE THE NORMAL SYSTEM DUE TO THE WIND PATTERNS AND % OF SUNNY DAYS PER YEAR. THERE ARE ALSO OTHER WIND ALTERNATIVES TO LOOK AT. NOT ALL WIND GENERATORS SIT ON TOP OF A TALL TOWER. THERE IS A COMPANY MAKING THEM WHERE THE TOWER ROTATES. THE TOWER HAS WIND VANES ON IT,AND DUE TO ITS LARGER SURFACE IT SPINS IN LOWER WIND THAN A NORMAL WINDMILL. IT IS SOMETHING THAT CAN BE BUILT WITH NORMAL TOOLS AND HARDWARE IF YOU PUT YOUR MIND TO IT. ITS JUST BIG AND UGLY. It is now 2014. I am in Australia. We pay about 31 cents per kWh.We are going off the grid once our subsidy runs out. Interesting information. What I forgot to mention before: the Kill-A-Watt meter. They are only $25 or so and can tell you how much energy any appliance uses. That is a great place to start. All of these folks who have ideas like the perpetual motion machine that would use the power of gravity in water falling from a height to pump it back up there, while somehow also powering a house, to the last guy who talks about free gravity energy need to wake up. Go back to school and this time, pay attention in physics class. There never was a 100 mpg carburetor…. There are only so many BTU’s in a gallon of gasoline. Sorry, that’s just the way it is. Energy doesn’t come out of thin air. The most free energy we have is solar. The sun drives everything, including wind, tides and waves, even fossil fuels that came from rotted vegetation in rain forests that grew in the far distant past. (Tell me again how we now have man caused global warming.) The reason most of these things have not been harvested successfully has more to do with impracticability more than anything else. Picture trying to build a dam across every cove or bay along the coast to harness tidal energy or putting up little wave harnessing machines as far as the eye can see… Possible…. just not practical. A home owner today can use the power of the sun for electricity and for heating, even in the frozen north. However, the ability to see through the crap fed to us by the “professionals” is not easy to learn. To hear them talking, it is not possible to live on solar electric power, not possible to heat a home in a cold climate and not possible to drink rain water without dying. We personally are doing all of these things and we have to reinvent the wheel every time we turn around because when you look for things to help you, all you find are profit producers with their hands out. We need back-up for the few days that the sun doesn’t give us enough and propane is the common sense answer today. Wood is OK if you are fit enough and if not allergic to the smoke, but if you are using a chain saw and gasoline, think just a bit. If things got really bad, we could live without either, but would we want to? I had some crazy local try to tell me that CME’s would melt my solar panels. Wake up, that is about MILES of wire in a magnetic field, not inches. Those of you who want to worry about EMP’s need to stock up on guns and ammo. You may actually only need one bullet though and maybe another for your spouse. To think that you will live through something that bad and somehow live a life worth living later is just crazy. Go rent the Mad Max movies, buy yourself a case of beer and enjoy. it is interesting that no one is taking advantage of free gravity, a 24/7 energy source that requyers no costly storage system. why is no one willing to fund resurch on gravity harnessing devices, but is bitching about pipelines, and not willing to put their money where their mouth is. what is your alternative to wood burning for home heating?. I just stumbled onto this site and as usual, find it to be full of frightened and misinformed people who don’t know where to turn. Only one thing I want to say. Well, a couple of things. I live successfully on solar power somewhere in Montana… Keep that in mind as you read. First, calm down and use some common sense. Crazy ideas for new technology are fine if you want to sit around and talk, but for real living you just need to think. Keep it as simple as possible. Second, alternative energy is all about battery CHARGING so you will have energy whenever you need it. (And batteries are not really “green”, but they are necessary.) That lack of charging is why the site owner had problems early on. Most information even today is wrong about this. Unfortunately you need to have some technical knowledge if you want to be your own utility and figuring out who to believe is a real problem. If you figure this out, batteries can last twice as long as most people will say. That company who made the big white inverter shown in this site never did figure it out completely, but back then they were completely clueless. The people building home made wind generators do not know this and they will argue that I am wrong about this. By the time they take an alternator that doesn’t produce enough voltage to work and then run wires with voltage drop problems that cut the voltage even more, they never get their batteries full. They can run things when the wind is blowing, but is that the goal? The same thing goes on in the solar world. There are still solar charge controller manufacturers who have things wrong, in 2014. People who trust that professionals who sell things with glossy brochures know what they are doing many times find out the hard way that those people have never lived off grid, so they do not know. There are power lines to their businesses and they go home at night to a grid tied house. The truth is hard to swallow. Let me tell you the secrets. 1. Metering… Find the Trimetric. The inventor lives off grid, so he knows. Where we live it was cloudy half of yesterday and it is raining today, yet I know that our batteries are at 90% full, so we do not worry; we live. 2. Truth in battery charging… Find Crown & Trojan… Not their dealers, go to the factory. Half of the people selling batteries are way behind the times when it comes to this and it is a world wide problem. How do I know? My wife and I have been unplugged since 2000. It was a long and frustrating journey to get where we are today, but we did it. And we do use modern appliances. We are not in the stone age. After years in an RV, we are building a home today and we have not run a generator here yet. I run every modern power tool you can name. Sorry, but I won’t give out my address and can’t get into long discussions, but if you have half of a brain you can find my blog. Best of luck to all. Funny a guy who works/ed at a power plant would bash “off the grid”. Off the grid living is more than plugging in solar panels and watching TV… Have you thought about supplemental power? Like HHO or a fresnel lens to operate a stirling motor operate a generator running off a car alternator? Your write up is well put together, and has give me some great information. May I ask what size of a inverter you are using. And what are the AMP hours your batterers are. Only wish I had the view that you have wow. See that I’M MY 70’S it was my dream to build a log house. So now that the is almost finished, I have a battery bank of 12 still waiting for the rest to arrive this week. Wow!!! I’m glad I stumbled on all this great information, and the concerns/challenges. It’s quite a lot to absorb all at once and I’ve spent several years reading about the basics of living off the grid. I’ve been trying to get my cabin on my 11 acres that I purchased last June 2013 in rural Virginia sorted out. I had no idea of how many permits were involved when one establishes a “new” permanent residence. If I had done this 3 years earlier these code compliance’s and permits wouldn’t have factored in. The state and county have recently implemented them for revenue. Anyway long story short, I purchased a shed and had it built to meet county code. Cost $9,000. for a 36’x12′ dwelling. I sold my 2600 sq foot home near Philadelphia after the kids moved out and after many years of working in the rat race I finally want to live as self sufficiently as possible. I’ve been training for this my whole life. Always hung clothes to dry, used grey water from washing machine for plants, grew whatever vegetables I could, recycled and repurposed. I’ve been renting a trailer this past year that is an oven in the summer and an icebox in the winter. There were so many setbacks. Never buy property unless you have it perked. We finally found a spot that meant the cabin had to transported down 1/5 mile down the field. Cost to have the dirt driveway was almost $1000. Several drain culverts had to be placed in low areas. Weather played a big role, it was so wet here this past year the ground was too soft to do any heavy hauling. But I finally have my cabin on footers and while it’s going to take some time to save money for the well and septic I am considering just moving out to the cabin and roughing it till I can save money for the well and septic. I actually can’t get an electric service hooked up until I have a well and septic system installed. I work from home and use the internet and was wondering if a generator would be sufficient enough for just me and a tiny fridge, internet/laptop and a micro-wave oven. I’m used to keeping my home cold in the winter and hot in the summer. I camped out all last summer while finding a place to rent. I don’t mind the inconvenience, it’s a challenge and frankly what else do I have to do with my time. I’m no spring chicken but I still have at least another 20 years of good hard work left in me. Also I plan on raising chickens and having a goat along with a huge garden in the spring. Any advice or encouragement would be much appreciated! Your mode of explaining all in this post is genuinely good, every one be able to easily know it, Thanks a lot. Have you ever considered creating an ebook or guest authoring on other sites? I have a blog centered on the same ideas you discuss and would love to have you share some stories/information. I know my readers would value your work. If you are even remotely interested, feel free to shoot me an e mail. With water stored at a height minimum of 30 ft falling to a turbine and being forced back up to the original source water should work to produce power indefinitely. The sheer force of the water pressure, greater with additional height, should push the water back up. Water can also be moved by the suction of air out of a water flow space. Does this sound like it would work? we need another tesla. he made the simplest item that could be mounted on any roof so that people would not be slaves to the power companies. of course, the elitists who needed to control the masses and use them as slaves, killed him, stole his research and countinue to tighten the financial screws to all of us. all of the ideas on this site are too involved, too expensive, and not simple. people need something real simple! now more than ever as florida power and light are going after those financially who do not want their unsafe, unhealthy, surveillance filled equipment, callled “smart” meters…..
Hello in the alternative energy world. Allot of interesting point have been made but there seems to be a lack of conversation around some real game changers in the world of home produced power. Anyone producing power on any scale has my respect. There are ways to produce energy at costs and overhead that make it much cheaper to produce than ongrid consumption, but the means to so seem to be taboo topics. I have spent a great deal of time researching and developing a home based system that is meant to provide power to rural areas where they have resources that suburbia don’t. When using a combustion engine generator noise is a big draw-back and when a site allows it it should be installed in a small bunker underground just large enough to house it, with a small quaint shed placed over it for other energy set-ups. First and foremost is using the generator as a means to keep you in power. With a combustion engine running on three sources of fuel them being: Gas vapor produced by ultrasonic transducer, HHO generating cells to back-up the fuel vapor, and finally regular old fuel to back them up. When producing vapor you can run a gasoline engine on diesel vapor, and you can run a diesel engine on HHO. This takes an initiative and willing to work the kinks out, but it is a truly remarkable means to off grid living. The pro’s to this is, you are generating AC voltage that doesn’t need converting for household use. To compliment this primary power one can add Wind-power, Solar-power, water/hydro-power depending on available resources. I am currently building my first methane gas producer harvesting off gasses from our septic tank. The Fuel vapor, HHO and Methane gas production all compliment each other in power production and delivery to a combustion engine which can share certain elements/components from each other in the production of these fuels. Any of us who have worked in this area know there is a violent history victimizing the pioneers of these systems. A sad but true reality. In saying that I would suggest you utilize and develop a system for personal use and not a commercially marketable product. protect yourselves from the power that be. It is my responsibility to educate my kids so they may educate there’s. It is a well known fact that these technologies have existed for decades and have been suppressed because of there effectiveness. It is also well known that those who control the machine we live in are not going to help us produce our own power. That’s just the way it is in western culture. Explore areas in other nations that do not have a power grid as we know it and see how they make electricity, really quite amazing and inspiring. I hope someone finds this useful. We have what it takes to make a difference a little at a time. Good luck, be safe, and have fun. Barry I am working on a project which my combustion engine will run on HHO. The generator is one from (30kw) wind generator which uses less torque and horsepower (PMA) than a conventional 1800 rpm generator. The wind generator only needs 250 rpms to produce the full 30kw. The HHO generator will have titanium plates verses 316 ss. I will keep everyone updated on the progress. Trying to lay low a bit. big oil hates this type of stuff. oh by the way the powerplant is 1963 ford 170 ci strait 6 with contact points. it has no possibility of getting damaged from an EMP event. You should look into a HHO generator to power your petrol generator. Water is free my friend! having them unhooked won’t help matters either. The only way that you can protect them is have them enclosed in a faraday cage. Okay so keep a few unhooked until then… but then again when the meteor takes out half the earth or when the antichrist comes it won’t work either, until then I’ll be peacefully slaying the zombies off the grid. Sheesh! LOL! Solar panels will be useless after an EMP event! Moderate usage is the key. I have been powering my brothers 3 bedroom trailer with 4 100 watt panels connected to 5 100amp hour batteries all winter. we outfitted his trailer with LED lights that I picked up on ebay > they don’t even register a draw when all of them are on. ( Look for dome light led’s ) and he heats and cooks with propane. He has to run the generator only if the sun doesn’t shine for 2 days or more but only for an hour or two each time. He watches his 32 inch TV for a few hours everynight. No refrigeration at this time (it’s winter coolers do the work) Again the key is moderate useage. He still has 4 panels in the box but he’s not in a hurry to get them hooked up until he needs a fridge/freezer. Life in upstate NY. I’m willing to bet that MOST people have no idea about what it means to live off the grid. It’s not simple and as energy companies stay ahead of the game and put themselves in service to consumers it will never get simple–EVER!!! my building is 1800 sq feet the electric line was cut for illegal use before I bought the property. The company wants $364.00 to remove the block and a big $500.00 deposit to turn my electric on. I’m wondering if it would be cheaper for me to go solar and stay off the grid in Detroit, Michigan. I’m a widow woman who is not afraid of hammers and nails. .Living on a very limited income. Hi, living off grid certainly needs proper knowledge,in my first response i had advised pure off grid but it didn’t go down well with some.Fact is, the dc motors nowadays are actually ac motors with built in square wave inverters. Since square wave inversion is very energy efficient and these motors are custom built for the current they are getting,the full house inverter however advanced can not compare with these brushless dc motors,besides a full house inverter holds you at its mercy. These inverters are meant to be used to simulate grid supply in times of power failure and not for off grid living. Similar to motors cfl too comes with built in inverter. LED is intinsically low volt dc operable. Hi Erik, fact is, people here keep the fridge as a status symbol,vegetarians don’t really need fridge.I used to feel that for just preserving half a litre of milk i have to keep running 165 litre fridge but then i switched to milk powder made by nestle,its better than the milk i used to get,so i dumped the fridge.for occasional use like chilled water for whiskey a 7 or 12 litre peltier fridge is sufficient and it uses 4o to 60 watts.Similarly with my 30 dollar 1.8 inch phone (c-1- 01 nokia) i do more browsing and emailing than most people do with 17 inch 3oo dollar note book,what with opera mini and ovi mail (ovi mail lets you attach file).talking of symbolism people in india are as pretentious and wasteful as in usa,instead of using fuel efficient 100 cc bike they go for wasteful bulky 135 cc,likewise in 4 wheelers.Its a sorry state of affairs for a third world country. Coming back to off grid, i think we are on the threshold of a sea change,dirt cheap panels are a game changer,some appliances like fan and desert cooler which consumes 150 watts can be run directly without battery for its the heat of the day that has to be countered. It is a very apt example of beating the enemy with his own weapon.sorry for my ramblings. Great post, Vivek! What’s nice about solar is the ability to expand the system if needed. As you mentioned, it’s not necessary to spend a fortune. I started off with two panels and smaller batteries and gradually moved to four panels and got bigger batteries. I thought I would have to expand further at some point but that hasn’t happened because I have enough electricity for my needs. I’m curious about your refrigerator. It sounds incredibly efficient. I tried various small electric fridges before finally buying a full size propane fridge. In my experience, the electric fridges (even the thermal electric ones) used too much power. I will have to look into the one you mention- 60 watts is extremely low for a fridge. Hi all, here in india we have lots of sun and solar panels work fine. The panels cost a dollar/watt and two hundred watt panels are the bare minimum,but we indians usually manage with bare minimum. Two panels one 100 ah battery and one inverter sum up to 500 dollars. Cooking fuel is lpg similar to your propane,for internet i use gprs in my java only phone, for a monthly package of 2 dollars i get 1 gb data which is more than i can use(i use 1/2 gb) java only feature is virus proof. For lighting 20 watt cfl fulfils the purpose. 50 watt ceiling fan cools the room while 20 watt table fan is an alternate. For refrigeration a peltier based fridge consumes 60 watt and being without compresser i switch it on when needed which is never for more than 2 hrs. TV is 7 inch chinese lcd with dvd player and consumes neglegible power,no other electrical appliance is needed.20 k is a far cry from half k that i have invested. A lot of great comments and information in the responses- however, I don’t completely agree with the statement about not considering solar unless you live in CA, FL etc. I do live in Hawaii so sun isn’t a problem but even on overcast days, the batteries get charged- just not at the same level as full sun. Also, it doesn’t need to cost over $20K to power your house with solar! I have about $8K into my system and I almost never run low on power. The key is having energy efficient appliances, LED lighting, turning off power when you’re not using it etc. I have all the basic modern conveniences and get by just fine with four panels and four batteries in my 24 volt system. Here in Oklahoma, we sell electricity back to the power company. Of course it’s Hot Hot Hot here and the wind never stops blowing! I think they should have named US the ‘Windy City’! 🙂 Thanks for the flip side of the coin tho. Whether you will live in Montana or somewhere else, look for a stream that is year round, a house that is on a hill where it is windy andn think solar only when you’re in a warm climate like arizona, california, florida,etc. If you’re near Lake Michigan, it’s almost always windy, windmills work great. A stream adds water turbine for electricity which is non stop too. Solar works great in places like florida for a cost of about $22,000 in 2013 it will supply your whole house. If you have a hurricane,you may loose it all The stream is the only guarantee and not in a real populated area as someone may complain. This system is actually very good! Its the power consumption that is the problem. I run a commune / green studies institute in WA state. We have 10 full time residents on 20 acres, most of which is farm. We have a much smaller system, but have NEVER run short of power, mostly because our residents don’t NEED to use so much power! We all have electric CFLs in our homes (made of earth by the way), A few of the residents have internet jobs for which I made good DESKTOP style computers that use 130 whats as opposed to the usual 500 to 1000. Sorry to ramble, but the point of living like this IS to use less.. Not to keep the exact lifestyle. And I don’t mean to preach, but you’ll have to give up a few modern conveniences if you want to be sustainable. Otherwise thank you VERY much for the info! It WAS a very accurate price and ability summary of a great system! Just an overloaded one! Glad to hear our article and the visitor comments were of help! I really enjoyed this article and all the accompying comments. I am a single mom in S. TX. and I homeschool my 2 kids left at home. We have been looking into different off grid living methods and are at this time, searching for a couple of acres to try our hand at building our own home, (really considering cob), to be as energy efficient and as self sustaining as possible. I am very interested in learning more about building our own solar panels, biodiesel generators, and alot of other ideas and solutions presented here. I would imagine that solar panels would probably work better here in S. TX than in Montana, considering that winters here are basically summer, with a cool front thrown in every once in awhile. All in all, thanks for all the info. These will all serve as instructional research projects for my kids, as well as having some of the items incorporated into our plans for our, hopefully, near in the future home. Just want to say lots of valuable information here, and I think that a person should give much thought to living off the grid. Costs are going up more everyday and the systems we have are not dependable and we are destroying our planet. We need to change our way of living. Thanks for the info. Keep up the good work! I have noticed the recent comments seem to be based on the premise that off-grid living has to be based on low energy usage, doing things manually, and cheaply. While that is certainly one end of the spectrum of off-grid living, I want to point out that there is the other end too. It may take more money to get the renewable energy capacity to run a house off-grid as if it were connected, but that does not disqualify it as part of the off-grid experience. Today’s technology has produced large and robust inverters and solar charge controllers, and tied together with an automatic start generator it becomes a hybrid system that can easily power a fully functional home – refrigeration, air conditioning, lights, well pumps and everything else. Need to heat the house and want to do it cheaply by using the wood on your land? Well, who says you have to split the wood by hand? Get a gasoline powered hydraulic log splitter or hire someone. Or better yet, install a radiant floor heating system that uses solar collectors for primary heating with wood or propane backup, and vastly reduce your wood burning. Frugal, simple, do-it-all-yourself living is a fine way to be if that is your goal. But it is hardly a requirement for living off-grid. Go to solarfloridahome.com if you want to read any of my Solar Living in Florida blog articles on how I’ve lived in an off-grid for the past ten years in a regular house. Thanks, and good luck. true age does play a huge roll in how we live… but getting the skills is not hard. just kill your tv and make time to read and do! my grandmother spit her own wood well into her 80’s! of course her wood splitter was an over head press… but still she cooked and heated her home until the day she died at 87 with wood she split herself. you do not have to do it all… but there are simple ways around most of the hard tasks.. I can not weld but I can drill and bolt, I can and have belt wind gen systems… I’ve trained my whole life on the simple life and how to make it… it’s not Mtv palatable and you have to learn a lot of what our grandparents took for granted… looking stupid for asking dumb questions is just a part of life for me! but you have to understand things like what is safe to do with your poo… NEVER back down from a question! no matter how stupid people make you feel when you ask them! The only way to live off grid is to drastically reduce your consumption,go purely off grid and use manually powered appliances as far as possible. With pure off grid i mean like a cellphone with its in built solar panel or a led solar lantern running on 5 volts with no energy loss on interface and other low voltage machines like 12 volt fan,some of the panels may be used directly in day time to save cost of battery. Clock work mechanism can also supplement in emergency or otherwise. Just a thought….. sorry if this comes out a little political…………but I saw a post talking about the grid and the shape it’s in and the plants making the power to the grid. It was mentioned about how frail or old it is getting and being in a better position to be self reliant to take care of oneself when there is black outs or other “grid” issues. The point I would like to make is while we try to be MORE self sufficient and may succeed at some level, we are still PAYING (taxes) for a nationwide system that has been let go to “ruins” basically by our governmental body. With the LARGE amount of $$$ spent on energy of all kinds………the basic systems have been let go. We may think we are “saving” the planet by downsizing our existence………but are we any freer in out lifestyle if we cannot be disconnected(no pun) from the tax man?? Hi all my off grid buddys, I have read with great interest your views and hot tips to use for living off grid. I have been off grid (not by choice) for the last 11 years and at first found it quite worrying, but now by using my trusted diesel generaters, one 18k and one 6k for backup also woodburner and oil aga for cooking and heating not forgetting our gas fridge freezer I think we have cracked it, and would not have it any other way . regards to all . Thanks for your feedback, valid points! From someone who lived of the grid for several years, you’re right, it’s not always easy. I read these blogs with a great deal of reserve. With few exception, most people wanting to live “Off the Grid” have little or no real knowledge or most imortantly, the skills needed to effectively make this living choice. Can you build your own wind generator? What are your welding and fabrication skills? What knowledge do you have about self contained direct current electrical systems? How old and healthy are you, can you chop 40 cords of wood? Where is your fresh water source? Not all but many who fall in love with the notion of “zero carbon footprint” living have a reality check when actually attempting it. Try a two week camping or hunting trip to remote cabin in Alaska for a test run. You may be surprised to learn how really unprepared you are mentally and physically for this life style choice. Let me give a simple example, What I am getting at is that most people fall in love with the sizzle of the steak, they don’t think about having to raise the cow, feed it, butcher it, preserve the meat, make the fire to cook it and only then comes the sizzle. Most give up at the butcher phase. Just my 23 cents worth, (adjusted for inflation). “insulate the crap out of our home” Wonderful idea!!! one thing I’ve found is the heating ducts! what is the use of having R-500 in the ceiling if your heating ducts are R-0??? Most forced air ducts go ABOVE the insolation and are poorly (at best) insulated! This is a great article, but not just for the article itself, but for all the comments relating to it. I’m in Ohio and have been wanting to get off the system, as well. I’m in a unique location…small town rural area, mild climate, no zoning. We have acreage but are offered pretty much everything to us grid-wise, except for sewers. Because of this, everything we’ve looked into to get off the system seems far too expensive to us, compared to our present option. Our goal is to save money, not cost us more. We also already have a house, so we don’t have the option of building one specific for the need of making it self-sufficient. I also don’t believe in having to basically live in the ‘stone age’ to make these changes. We’re now passed the year 2000, why should we have to live like Amish people to do this?? We looked at the water gravity theory, but from what we’ve learned it costs as much in electricity to pump the water up as it makes. Solar still hasn’t gotten to the point of being cost efficient. We have a lot of people around here with wood burners, but it’s too centralized and difficult to regulate (plus the whole chopping wood thing). I don’t see propane or diesel being helpful since the price of gas has been ridiculous, lately (I had a propane tank before. It cost us double over the normal gas company. We changed to an all electric home with heat pump…that atleast saved us money and got us away from the gas company). From what I’ve read so far, it seems our next best step is to insulate the crap out of our house, and save more that way. So, we’re probably going to do that. But other than that, I’m simply not seeing anything else cost effective for us. I’m hoping sometime in the future that will eventually change, though. Thoughts… PVC pipe is not good for wind turban blades and it becomes brittle and losing a blade in high wind is dangerous!!!! also getting air from under the ground will bring mold and toxins from the pipe into the house!!! not a good idea… any well sealed home needs to be a low toxic as you can get!!! simple hand tools and learning to work sheet steel, and water pumped systems is the key! start simple and work your way to full off grid… it’s a total life change! How to save energy wear warm clothes in winter no clothes in summer become a vegetarian live in a small house learn to read its better than watching tv go to bed when the sun goes down that can be fun . Be sure to wrap your entire house in aluminum foil, and cardboard in case of solar surges on the 21st, or you will be screwed!! Perhaps more than the rest of us! I posted a year ago, when we were just starting to build our 1,150 sqft off-grid home with attached barn (1150sqft) in western Maine, USA. Below is a summary of what we installed in 2011-2012, with costs, to meet the needs of a 2 person year-round household with propane supplement. Please note: home was designed for off-grid power, with 8″ thick blown insulation walls and passive solar design. Barn is bermed into hillside and insulated to remain above freezing year round. (9) 224-watt solar panels with ground mount aluminum frame on elevated, level gravel pad. Set to WINTER sun angle. (12) 6V deep cycle 7-10 yr lifespan batteries, mounted in basement in a air/watertight plywood box. Many appliances are switched (like TV and computers) so power to area can be totally killed when not in use. So far, the system we installed generally meets our needs, but requires us to be judicious with power consumption. We fire our generator about 4 times/ year. I know first hand how tough it is to get reliable specifics on off-grid systems, so I appreciate some of the posts in this site. Thanks to everyone else who participates. My wife and I have been off grid for almost ten years now…in Florida and our second home in the Blue Ridge Mountains in North Carolina. I can say that living off the grid can certainly vary with your local environment. In NC we have a creek and get our electricity from a micro hydro turbine which gives us 14 amps at 24 volts DC 24/7… the creek only gives us around 5 gallons/minute, but we can get 100psi out of it. Rarely (maybe once/year) need the gasoline generator. Of course, we have no air conditioning… but all the other comforts of a regular home, including a electric fridge, tv, and washing machine. In FL, I use solar primarily, with a diesel generator backup. Since we had become more reliant on the generator over the years, I just upgraded from a 1.8kW solar to 7.7kW, plus increased from 4 Rolls Surrete 6CS25PS batteries(318 lbs each) to 12 of the same. The upgrade alone cost $35k. But it means substantially less use of the generator and therefore lower day to day costs(even though we burn used vegetable oil in it instead of diesel). Our biggest energy hog in FL is air conditioning…but it feels soooo good. If you want to read about the details of the upgrade and other blogs I wrote about my experience living off the grid,go to SOLARFLORIDAHOME.COM or Google “Solar Living in Florida”. I’d be happy to answer any questions. Nice article. Keep up the good information stream. Interesting article- but it does leave the wrong impression, IMO. I’ve been off the grid in Hawaii for five years and live comfortably with a simple 24 volt system consisting of four Kyocera 130 watt panels, four large Trojan batteries, and a Xantrex 1500 watt inverter and charge controller. I do use propane for the fridge and partial hot water (solsr during the day). Solar is cheaper than the 42 cents per kwh the power company charges and it’s much more reliable. Maybe it’s not as efficient in Montana where they may be much less sun but here in Hawaii, I would never go back to paying the electric company a dime. To those who speak to the return on investment idea, I ask: did you ever buy a new automobile for $25K, then learn 10 yrs down the road it is only worth $1,200. You used it, you drove it. I take the same view of solar. Once paid for up front, it is like a cancelled check, like yesterdays news but from a cash flow basis – a great improvement. I will simply forget the sad day when I plunked down the $20 – 30K or so to go ‘off the grid’ for electric power and water. That is, I have 2oK to ‘throw away’ on what people seem to consider a non-profitable loser’s investment of ‘solar power using what will be 2013 technology. I know the 2020 stuff will be better. Is there a way to go off the grid, and have water, even though there is not a well? Any idea of the cost? Will you please ball-park the cost for solar equipment (not land or building) using 2013 technology and 2013 dollars? Enough rough guesses will let me know if I am having a pipe dream or if my project is doable with my budget. I know: I can rent a 1 beroom condo with a garage for way cheaper and get all the above. But I am a twist. Being totally ignorant at this moment I optomistically hope that I can buy enough roof panels and solar arrays and batteries or what ever to power a very small insulated concrete block type place. One bedroom, a kitchen, a living room. The biggest unanswered concern I have, and something not discovered by me on this thread, is of course getting WATER in the middle of the desert. I have heard no mention of ‘Atmospheric Water Generators’ on this thread. And, the humidity here is low, to state it mildly. There is no rush here, but, the possibility must exist to eventually get water. Say for the first couple years I get a cistern and a purifyer and truck water in…. well ok. But meanwhile, I am working and making money so I can provide the capital for water production. Depending …. would it cost more than another 20K for water? And would it be reliable enough so that only minor inconveniences might be encounted sporadically in a typical year? 1) WATER is my biggest concern. This seems the highest hurdle. It is a showstopper. No sense spending very much time on the rest of this unless I can get water ‘off the grid’ too. 2) 400-800 square foot dwelling. 3) Insulated to the ‘practical’ max. 5) Heat – No specifcation: guesstimate: Never freezes: need capability to add 20 degrees farenhieght to whatever? 40 degrees + 20 = 60 degrees = worst caase scenario? 10: Internet – will be available I think. This thread was started in Montana, right, 4 years ago this November. Thank you Mr. & Mrs Ritzman for sharing your experience. I have been reading with a sustained interest the various opinions and very good advices advanced by many of you. I am really thankful to you guys for your contribution. After 42 years in New York I decided to go back to Haiti and build a house in the mountain. I have to live off the grid for the simple reason that there is no grid.THE infrastructure is inexistant where the house is located. The house has a breathtaking view of the sea and surrounding mountains nearby. You could turn your generator into a wood gas generator instead of petroleum fuels you burn wood and can use the heat from the wood to also heat your house. I would also build an axial flux generator to add more while you have wind and you can gather the parts and build one instead of purchasing them. You had trouble with most fuel non liquid in cold temperatures. Russian truck drivers use normal 20W light bulb in gas tank to warm up the fuel. -10c/14F is usually warm enough for summer diesel. And then again you could run the fuel pipe through your house or any other heated area and this will heat “enough” the fuel. @Arizona2ride – The hand crank washing machine is called “Wonder Wash” By The Laundry Alternative, Inc.
@Arizona2ride – I mainly chimed in to alert you to a new (to me) type of hand crank washing machine. My friend just purchased one, and he loves it. I have no idea how much it was, but they are out there. I could ask him about the price, but I don’t feel right about that, so I’ll check the brand name on it and post it here for your consideration. Sounds like you have things pretty much planned. I would probably add geothermal to the mix in your design plans, and also an outdoor wood burning furnace to help heat your home and water, and also keep your indoor air clean. The brand I’ve chosen has several different designs for specific needs, but I’m certain you’d have to have some sort of power supply plus an air handler and water heater for storage, if you chose that type of system. We are incorporating solar, wind, hydro & geothermal into our two earth homes, one located on a rugged mountainside on 21 extremely rural unimproved acres, the other an isolated 8 acre spread which is improved with a well, etc., and a bit closer to civilization. And also, we’ll be using solar for the RV. Good luck with your endeavor! Sounds exciting and extremely challenging. I have friends in Montana on both sides of the Rockies, and they are truly hearty souls! I couldn’t do it. Best wishes! This is an awesome little website for comments. We live in Alabama on 11 acres in the south in a very rural area. We are conservative already as it is. I use the sun and wind for drying the laundry outside. Nothing is on during the day except the frig and ac unit. I cook once a day and want a wood burning stove and root cellar. We are putting in a root cellar in the spring. We have chickens. We are wanting to go off grid. What a better place than montana, wide open and not a ton of people. Things arent going to get any cheaper any time soon, why be in the southeast and surrounded by folks who will steal and kill you for what you have? Not me. If folks can survive for all these years with out power of any kind then we can too. Lights, oil lamps, heat- stove or fire place, water dig a well and use a hand pump, dig the garden with livestock, meat- hunt or chickens. Bout the only thing I would have to have would be a washing machine and frig ( but woudl use a root cellar) I think we would build a self sufficient home with out all solar or wind powered items. The floor plan would have to be laid out so heat would travel properly throughout the home. Any advice on totally living OFF THE GRID, with NOTHING??? My parents use geothermal and have for over 15 years so I know alternative sources work BUT I don’t know which ones would work for me. You see, aside from the environmental aspect, I just want to get away from ridiculous COMED and their horrible service (they are the only company I know that is able to survive while treating customers so horribly!!). Would anyone be willing to give me ‘baby step by step’ instructions on how to work “off the grid” electrical in a small 500 ft condo? Almost everything is run on gas right now but I still need lights and my referigerator. I’m excited to see what options I may have! Thanks for the feedback. When you say the government won’t issue permits to set up a home off the grid, I assume you’re talking about building permits. We built a log cabin in rural Alabama and lived in it without power for several years with no problem, but I never applied for building permits. I enjoyed this site immensely. I have recently purchased 10 acres in AZ. I plan on 100% off grid. There were a couple of things I did not see mentioned in here. First, if you plan on feeding power back to the grid, they do not tell you that in order to do that, you have to use store bought equipment and have it installed by a certified professional that they approve of. Increases the cost substantially. And will probably not ever pay off. The warranty will expire just as it pays off so only benefit is gained only if all equipment continues past warranty (yeah right). This seems to be the case in most areas. A lot of utility companies won’t allow any excess power to their grid. So, if you plan on feeding the grid do not count on DIY equipment. Second, is that our wonderful government won’t issue permits to set up a home unless it is connected to at least electric grid. (Unless extremely far from property). Also, if on disability or retirement benefits same problem sometimes worse. Even if I could get permits without hooking up to power grid, I could never get approval from my wife’s SSD to have her live on the property without at least power. Fortunately, everyone here is on well and septic so I don’t have to deal with that. Fortunately my neighbors have hooked up to the grid already so I just paid the utility to put a pole at the street and I am responsible for the 1500 feet back to my property. (They wanted rights to easement and run more line and transformer but I researched and found that with largest possible cable I could run 1500 ft without transformer or lines – so I gave them no rights – HaHa). Now the plan is to get initial permits and SSD approval for home while hooked to grid then disconnect and only use in emergency) I will be building a large home that will be utilizing geothermic for majority of heating and cooling. Solar for water heater and clothes drying.4Kw of solar panels for power during day and 2Kw of wind power for nights and windy days. This will all be backed with a matched battery array and a self made generator (already built). This should be sufficient for my house, barn, greenhouse (automated climate) and shop (income). Coupled with efficient appliances and building methods should provide a relatively “on-grid” experience as long as carefully monitored. Most of this will be DIY. I have already done it once (on a slightly smaller scale since I only had 4 acres at the time). I believe that we have the ability to use modern technology and ancient methods together for a very minimal impact living. I am not a tree hugger or environmentalist and I do not believe in the validity of global warming. All the same this method of living is beneficial for health, independence from government and financially. Thank you again for this site and all of the responses (except for the misguided liberal ramblings). Keep up the good work. have you ever heard of amish people? come on! electric lights should be used as a last resort. skylights and oil lamps can provide all the interior light you need, and with rechargeable flashlights you’ve got it all. i hate hearing people talk about the pitfalls of off-grid electricity and theyre using satelite tv and dishwashers and air conditioning. going off grid is a very viable option that can offset alot of what jp morgan and jd rockefeller have done to destroy the natural resources of america. $26k? get outta here with that crap! build your own set up, batteries, wind generators, pv panels, charge controllers, inverters, and monitors are much cheaper that buying a pre-wired pre-configured system. ok, you didn’t list “air handler” under the list of electric appliances, but mentioned your thermostat setting later. it sounds to me like you don’t understand how living without many modern conviences can make off-grid very cost-effective and allow you to have a negative carbon footprint. Handwash your clothes and dishes, use wood-buring appliances for water and home heating, and also use open windows and small fans to cool your home (also home size is a big factor, look up ‘tumbleweed’ homes). Don’t forget about converting edible calories into electricity with bicycle generators (possibly incorporating a high-voltage coil). You can live very comfortably off the grid at a fraction of the costs you outlined and maintain a negative carbon footprint (if youre not lazy). I am designing a small underground city for the future. Maybe 250 people. Live, work, play, all underground producing our own energy and food. I do not care who has my e-mail, any energy info is helpfull. The water and food part is taken care of to include a 100′ waterfall which will help with power, and small lake with fish. There is already allot interest and some places to do this around the United States. Thanks for the kind words! I’m glad to hear that our article has been helpful to you. My apologies. Kudos to Mr. Lipford and Mr. Erickson, as well for this treasure trove of information! First, I wish to thank Mr. Ritzman for this forum and all who have contributed the very useful information here. I too, will soon be living in a very rural area and absolutely refuse to pay any more money to utility companies. None. I’ll be completely off grid. While I was convinced I had everything worked out, both economically and efficiently, utilizing solar, wind, and mostly earthen construction for my two story, 2400+ sq. ft. home, I’ve found even more info to delve into in this most enlightening thread. It is a virtual gold mine of information and I’m absolutely delighted that I ran across it amongst the multitudes of others offered. I must say, the nano type solar panels have piqued my interest greatly, and now I’m on the research trail again. Everything else is already in the works. I’m in the Midwest USA, so all info is useful in that it can be modified as necessary to meet my needs. Thanks a million to all! Now hang on, solar power doesn’t need to be useless forever. Self-replicating nanobots could produce a self-sustaining nano solar panel the harnesses 100% of the sunlight that hits it. Since it is made of self replicating nanobots that get their power to replicate from the ground; the solar panel will never break or get worn out and zero money will be needed to sustain it permenantly. Miracoluosly, if it was large enough to gobble enough solar energy and store it within field containments and release the electric generated only when it’s needed, the single nano solar panel could power a 3 story home, a farm the grows enough vegetables to feed both your family and farm animals that can be bred and slaughtered to be preserved for winter…INDEFINATELY. Therefore, you would no longer need money or a job. To folks that are getting excited about installing a PV system, remember it is not always the best use of money. The best thing to do is first decrease your household’s energy usage. A general rule is that for every $1 spent on upgrading appliances to energy efficient ones, a home owner can save up to $5 on the cost of a PV system that would power it. For example, this makes a $1000 refrigerator pay for itself quickly. Have you considered using water and gravity to store your power. Even large scale power plants are starting to use this. It’s not new but its not been explored much lately. Basically you have two places to store water. One at a higher elevation then the other. The power that you generate (that you don’t need immediately) is used to pump water from the lower tank to the higher. Then when that power is needed it is released to the other tank (turning the hydro-generator) to be turned into energy. It is also a good way to supply a constant steady rate of power without regulating because you control the flow of water. Thanks for the feedback and info on off the grid systems! I didn’t read all the comments, so this may have been covered. I did some calculations for off-grid systems, and with the fees, taxes, and misc. infrastructure charges going up every year, an off-grid system can pay for itself in less than 10 years (depending on where you live). The author was comparing the Kw per day cost, but a utility bill is 30-50% taxes, fees, and other misc. cost. I live in the Midwest and my U company is now charging me $10.00 per month to educate their customers on better energy uses. The non-energy portion of my bill has gone up an average of 25% in the last 3 years, while my cost per unit of energy has stayed the same or gone down. If this continues, regardless of the cost of energy, the fee-part of the bill will double in less than 3 years. With the US utility infra fracture requiring more and more debt to maintain, I suspect the math will just favor off-grid systems more and more in the future. The same is happening for water, natural gas, and sewer bills. Of course, grid-connected system would still be stuck with these costs, but that could be off-set by selling energy back, thus creating a monetary net effect. I am looking at building a house in Scotland and the nearest utilty connection is over a mile away. It appears the cost of the utilty connection will be higher than the cost of 4kW solar photovoltaic panels, a 6kW wind turbine and mast and a relatively large bank of batteries. Also our government actually pays people to generate renewable electricity (and hot water) so I think I will be staying off grid, at least initially. Living off the grid doesn’t need to be that expensive at all. Although you can’t do much about the cost of your battery bank, you can save a ton of money on solar and wind energy. I recently purchased plans for DIY (do it yourself) solar and wind energy and to be frank you can build your own equipment very easily and save thousands of dollars like i did. Ebay is a great source for equipment at great prices. The best part is that these plans are so thorough anyone can do it and I mean anyone. I bought a 1600 watt turbine for under $100 (regularly over $400) and built the blades and the rest of the simple system from the plans i bought. Total turbine cost was under $250. I just bought over 550 solar cells for only $240. Although I have to build my own panels, I can build one 120 watt panel in two days for under $200. It’s very true that living off the grid is not a one size fits all proposition. I am fortunate enough to live in the mild climate of the southeast, so I don’t face the challenges of -30 degree temps or too much snow. I wonder, does the wind generator ever get iced over? And do you have to spend much time clearing snow or ice off the solar panels? Thanks again. Great summary of off grid startup costs- we recently installed a solar system with 16 batteries to a home we are building in Maine- for us the cost comparison was different because our driveway is 1/3mile long and we needed to figure in the cost of running power. What is the make and model of your washer and dryer?do you like them? We are considering augmenting with wind-how much power does your wind turbine generate relative to the solar panels? We are midway through building. Is there anything you’d build into your house to increase efficiency based on the experience you have? We’ve sized our system for the lifestyle we want (I hope) but like Montana, Maine winter is long, dark and cold. Any building tips appreciated. Thanks! You pretty much rapped things up for everyone.Nicely put! The type of off grid energy you choose to use should depend on the area you live in,mother nature provides free energy for everyone be it sun,wind or water. I’de like to share with everyone another prospective. Energy sufficient homes (how they’re built and materials)are just coming into the picture.But I should warn you that these too depend on where you live. I may not live in the states but I too get very upset when I watch on the news natural disasters that put people out of their homes. If you live in an area that suffers from cyclons, homes of a more sturdy structure are needed and not of light materials,such structures are deep cement foundations, no aluminium orientated foundations and well fitted windows and doors. If you live in an area that suffers from earthquakes again you need anti earthquake structures with lighter materials-aluminium. If you live in a very hot climate,lighter homes with lighter but well insulated materials as goes for very cold climates. If you live in areas in a low geographical position (according to horizon) you need to uplift your home to avoid flooding.If you want to build on a slope check the type of ground and build deep foundations to avoid a mud slide.If you live by the beach avoid metals and wood-rust and corrosion.If you live in woodland/forest I know you may not like this but you should keep the area around your house in accordance to its height clean from trees and tall grass so that if there is a fire your home will be saved and only everything around it will burn to the ground. Proper insulation is a must for all cause it really does make a difference and life easier. And if you live on a flat normal piece of land with no natural disturbances , well then you’re lucky aren’t you? A few comments. I live in Alaska and discovered that you do not want to vent your dryer into the house as in a well sealed and insulated house you will have a very bad humidity problem. 100% humidity in a dryer =200% humidity in the cooler house and every thing cold will condense water. The water from your clothes will be effectivly wrung out and poured down your windows. If you do not have a well sealed insulated house, go back to step one, as you should not use energy to make up for energy loss that can be prevented. It is just not cost effective. If you count the costs, insulation is worth its weight in gold literally. So the first step for energy independance is not wasting energy, followed by not using energy in the first place. For example, all compact florescent bulbs, no electrical Heat generators (toaster, oven, water heater, dryer) means you need one quarter then electrical generation. For a whopping tens of thousands of dollars in generation systems cost. NEVER use high quality electric power for low quality energy such as HEAT. If you want to run a dryer because you just did not understand the concept of living with less energy, and wanted to save the heat, use a double walled stove pipe for an exhaust pipe and a small fan blowing air down the outer pipe. This will transfer the heat without the humidity. Last suggestion, as I have to run, is if you have a air tight nicely insulated house, dig a 100 foot 7 foot deep ditch and bury a 6 inch pipe in it to your basement. Use hat for makeup air to your house, with a small vent fan drawing air out of the top of the house. That makeup air will be between 45 (alaska) to 65 (Arizona) year around. Lot easier heating your makeup air from 55 degrees to 70 than from zero to 70. For the cost of a small fan, (and a lot of weather stripping and insulation) you can heat and cool your house for 50w watts using geothermal. Not 1500W for a small airconditioner. Most important part of any Off Grid system is a very insulated house. The BEST is poly foam concrete construction. You can R24 your wood walls, but 6 inch walls have R4.5 wood strips every 16 inches. Your R24 walls work out to being about R 18 with that style construction. Power you do not need, you do not need to generate. Second most important part of Off Grid living is relearning to live as our ancestors from the ancient days of say, 1950 or earlier. We have become totally spoiled with free power. Often there is a better solution that is not energy intensive. Power you do not need, you do not have to generate. Third most important thing to do in my opinion is see what is available and does not have to be imported. If you live in the woods, wood. The sea, wave power or tidal, creek? Micro hydro, sunny area? solar. What you do not have to import is OFF OFF GRID. Being off the treadmill of having to feed your energy system is the other end of the spectrum. The way Off grid fails, is trying to live as if you are on the grid, with an off grid system. Oh MY! Better have a gold mine. The path to success is living off grid as if you did not know what a grid was. That works very well. Sun goes down? Go to bed, get up when the sun goes up. No light bulbs, no gas for generator. But, if you live as if you are on grid, just think of splitting the 50 cords you will need…vs the 5 if you just are heating the house and running your laptop. I think some of the folks were a little hard on the author who started this sight. Every body can set back and give and take away from the beauty of having some bit of self reliance, no matter how much or how little, it’s still a beautiful thing to have some independence from Goliath Power Mongrels. Never forget, when the grid goes down, that were all so reliant on, and it will, and stay down for longer than human patience can endure, and it will. That off grid stuff is going to feel mighty fine. Mother Nature is coming our way in a furry seldom seen and in Biblical Proportions. I am very sorry for the masses of humanity that are going to be totally taken by surprise. God rest there souls. Get vigilant in your watch! No time left to waste. I didn’t mean to end this as Doctor Doom. Forgive me. One source of electricity might be sustainable if you are by running water, especially a fast moving pool (a waterfall). You could direct the water through a hose to a generator and produce all the electricity you need. You could also save more battery power through this method. Just a thought, hope you are close to fast moving water or this gives you another idea. The author makes troubling conclusions that the average person may take to heart. First, you must determine how much electricity your household uses then build a generating system to match your use. The author claims that his system cannot be relied upon when needed. This is only because the math and planning for consumption was not done ahead of time. ANY off grid system has a battery bank and it should supply you will enough back up power for several days not one! My off grid home was designed for my needs and it works like a charm. If my need for electricity increases, then I must add more PV panels or another turbine. Usually though, I have plenty and actually have more power coming in than I can use. Only around the winter solstice with cloudy stretches, do I need to start the generator for a bit. Planning, conserving and knowing HOW to maximize your use of energy makes all the difference between successful off grid living and failing. Unfortunately it is the failures that people like to use as reasons for why living off grid does not work. Also the prices for PV panels and the turbine/tower seem high to me. Shop around! Last item which comes up regularly is the pay off time. When was the last time anyone calculated a pay off on their dryer, TV or dishwasher? If people figured out the pay off time on a dryer versus a clothes line and clothes pins, they would never by the dryer. “Surviving Off Off Grid” by Michael Bunker on Amazon.com it is in most book stores everywhere now. Not a how to book but a book that will make you think about everything you do concerning you and your family. hi i am interested in putting a 3bed 2bath double wide moble home 100% off the grid the hot water heater,dryer and stove will run off propane. i will heat with wood year round. i am very new at this totaly confused is more like it. how many batteries would i need to make my bank with enough storage? I dont want to sell myself short. has anyone ever thought to run an electric motor inplace of a gas motor to power a generator? would a small wind mill with a solar pannil be enough to power the generator motor for a few days? How small of a bank could one use? It is not a good idea to try to reclaim the heat from your clothes dryer by simply unhooking the vent hose. The lint is NOT the only problem you need to be concerned with. The moisture that comes out of the clothes with the air will stay in your house for awhile, until it is eventually vented. If it hits a cold enough place in your home first (at a temperature at or below the dew point), it will condense back into water and stay for much longer… The worst – and most likely – place that this would happen is within the outside walls, where the colder outside air meets the warmer inside air. What is the result? A serious mold problem within the walls, which is messy, difficult and/or expensive to repair. It can also cause some nasty medical problems until it is repaired correctly. Of course, this is more likely to happen in a humid climate. Yes, there are ways to reclaim some of that heat (with a heat exchanger), but it will take little more effort and expense. I was so shocked to find out that the average citizen can “go off the grid” and generate their own electricity and it was not in a disaster like a huricane or snow storm. I live in Pembroke Pines FL, the Sunshine state and the power lines run paralel to my back yard. My neighbours are colse to me and I would like to know what I would need to do to go off the grid and if I need to check into my city to find out what their ordinances are concerning this matter. Thank you. Thanks Benjamin, glad it was of help! Good luck with your endeavor, and let us know how it goes. This is my first visit to your site. I was recently introduced to the concept of off grid living and I am very intrigued. Because of my belief in the bible prophecies concerning the end time difficulties that may be coming upon our generation, I am looking at ways to develop community living where all of us in the community use and pool our resources to care for one another. I don’t know that this means living together in a commune type of situation. We currently have 10 families doing this in an area of Florida spread out over about 25 miles. It’s fascinating how our love for one another compels us to work together, buying and sharing food resources, child care, homeschooling, sharing information, bringing new folks into the fold, etc, etc. I am particularly interested in the possibilities of pooling money within our communitites among those of us who share the love of God. No matter what else we do to create an alternative lifestyle, I feel that we have to get ourselves out from under the banking, lending, government, and insurance industry. Perhaps there is a way to do this by pooling our finances, as well as unsubscribe to the belief system that has gotten us (believers and non-believers alike), in this mess in the first place. Found your article very helpful. Would like any additional information you have, especially if you know where equipment like turbine, blades,inverter, drawings, plans, etc. are available, as I intend building a wind operated turbine to add to my home 120V system panel. Or is a magnetic power generator a total myth? This is my first time on this website too. I thought the article was super interesting! I’m also new to learning about green energy. I stumbled upon some articles talking about magnetic generators but not sure if we have the technology to make it a reality. Either way… I long to be off the grid, but simply can’t afford. I, like Jim K., also live in the city, and rent so my options for green energy are non-existent, except to consume less and/or be more conscious about being green. Great article though, thanks for sharing! What about a magnetic power generator? I’m just now reading on it, learning, but it seems as they are greener and more convenient than solar, wind, or other methods to create energy. Wow, way to go! It sounds like you’re really living the green life. You can find all our eco-friendly articles, from how to save energy to ways to recycle to tips on improving your indoor air quality, on our Your Green Home page. In addition, our Thinking Green section has lots of videos tips from Danny on how to live a greener lifestyle and help the environment. Like a few others , this is my first time on this site. I live in the city, and rent, so my options on living off the grid pretty much don’t exist. I do however take every possible step I can to reduce my energy costs and reduce my carbon footprint that I can. I thoroughly believe in green technologies. I keep lights off whenever possible, use florescent bulbs everywhere at the lowest wattage possible. I only use the AC when absolutely necessary and at the warmest tolerable. I prefer to keep the widows open and use the cross wind. If necessary I will use a window fan. In the heat of the summer when there is no breeze, I will draw all the shades to keep the sun from heating up the house so as to try and not need to use the AC. I purposely chose a place with an electric furnace to try and lower emissions into the air a little, if that helps, I,m not sure if it really does or not. I keep the furnace clean regularly. I seal the windows during the winter and use air seals on all doors and windows. I changed my shower head to a water efficient shower head and use as little as possible. I try to cut corners everywhere I can. Heck, I don’t even drive anymore. I prefer to take the public transit because in my city our buses use soy diesel and that is a green, renewable fuel source. If possible, I will walk to buy my groceries, all organic, or any where else I can, or ride my bike, great exercise. I can’t do a lot living in the city and renting but I try all I can, so wish me well in my struggles. Praise God for you Amanda. I love your approach and your determination. I looked at the solar oven you provided by link and loved it. Also, one can heat their water for household use with solar, simply. If you have a wood stove as I do, while most heat goes into the room air, a monster lot of heat is vented to the outside. You can reclaim a portion of that heat to further warm the interior of the house. My wood stove has a flat top and I do all my cooking on that surface. Simple metalic spacer materials on top can reduce heat for one pan while another sits directly on the surface. And it’s free cooking since you are already trying to heat your interior. You first heat your food, cooking it, then automatically that heat disappears back into the surrounding air to help heat the house. I can’t believe how many people do NOT dry their clothes outside. The only time you can NOT dry your clothes there is when it is raining. Even when it does rain on my already hung out laundry I just call it God’s final rinse because it won’t rain forever. In the coldest of winters your clothes still dry out there by sublimation. Wet clothes will always dry outside unless you have precipitation, yet even that only just delays the process. I have a friend who created a mamoth water tank (lake if you will) that is very deep (depth is critical). He put in plumbing while the pond was being built. Now he uses a very small pump to bring the really cold water (50 degrees) from the bottom of the pond up to the condenser in the house. It does the same work as a compressor (drawing heat out of the room air) but with almost zero cost after the initial minimal investment. This won’t work for everybody but nearly free and unlimited air conditioning all summer should excite most any modern human being – most especially down in south Texas where I hail!! So many ways to merge the best of modern society with simple solutions from the distant past centuries. While the equipment listed was expensive, it wasn’t compared to the alternative: having the power company run power to the site. Even at the relatively low cost in the area I live in, it would cost 50,000 dollars to run power onto my property from 2 miles or so away, PLUS the power bill every month. The 28000 spent is still not in the same league as bringing power in and having a power bill. I agree with the other comments that perhaps you don’t have enough battery for the house. You may need to have more battery power to take advantage of your system. Water based geothermal heat pump systems are very energy efficient, though they cost more to install than traditional heat pumps. They use a drilled well to circulate ground water through the HVAC unit. Check out our video on Geothermal Heat Pumps to find out more. Kudos to the author of this website. You have provided valuable insight to the average Joe. Question: Has any research been done on using geothermal to heat and cool homes? By geothermal, I mean burying PVC pipes into the ground (in a zig zag U pattern) and using a fan to push air through to acquire heat (or to cool) the house. I’ve heard of some people have done this. Is this doable? Check at Sam’s Club for 6 volt golf cart batteries. They have 220 amp hour capacity, can be wired together for 12 volt or more systems, last 5 to 7 years or more when properly maintained and cost only $72.00(approx.) as compared to the other options. I have a metal roof. I have heard of adhesive backed roll roofing that is designed for metal roofing. Although I have scoured the internet, I haven’t been able to come up with anything concrete on the subject. Has anyone else ever heard of such a thing? I am also told that if I am willing to forgo the sound effects of rain falling on a metal roof, there are shingles that can be applied to standard roofing that has solar panels. If you want the heat from your close dryer, take the exhast hose and put a paer of pantiehose over the hose, makes a great filter. I’m curious about the routine maintenance required of the alternative energy sources ie; how often to clean solar cells; replace batteries; what is required for the wind turbine? If I want to go away for a few days can I leave the home and not worry? I confess that I’m no Green eco warrior, I don’t believe in man made climate change and i think for the most part the environment is doing just fine. I just want to spend my 14 non working hours per weekday and whole weekends living away from the rat race. My 2 room cabin on acreage in Victoria Australia is well away from the grid. If one dismisses the feel good but expensive, innefficient, unreliable and high maintenance solar array, dual axis tracker and wind generator from the equation $15000 can be deducted from the up front costs of running Bobs household by simply running the generator into the battery bank and invertor. The used old school 6KVA 18 horsepower gasolene generator I just purchased set me back $1000 and according to the spec sheet uses 1 gallon per hour at half load (3KVA).At $4.00 a gallon I can run the Genny for 3750 hrs to keep the batteries charged, or maybe almost double that with a deisel engine. Another possible alternative fuel supply for the genny on my 44 acres of woodland is to build a wood gas producer to run the existing gas engine. Environmental issues and hippee dogma aside,would any of the electrically knowledgable contributors here agree that this is the most economical and practical way of living off grid ? we need some advice on how to improve our insulation on our home. We live in blue ridge ga. The house is built near a large stream that required us to build the home 12 feet off the ground. which worked out fine by placing 3 garages and my shop under the house. The question is hows the best way to insulate the floor or ceiling of the garages and shop??? We placed r-19 in the floor with the paper side up toward the living space. Could we use styrofoam and sheet rock to close it up?? just not sure on how to do the job better. Good points. Also, if you install an alternative energy system while on the grid, some states will allow you to sell any excess power generated back to the utility company, and you won’t have the expense and complications of a battery backup system to store the power. Plus, you can take advantage of the 30% federal tax credit for the cost of installing a solar or wind system. To find out more about the tax credit, read our article Energy Efficiency Tax Credits for Homeowners. This article fails to mention that if you live in a rural area where power lines do not already come to your porperty, the cost of bringing power lines to the property may equal or exceed the cost of a complete solar system. That triples the cost of “conventional” power over the lifetime of a solar system. The article also doesn’t step back and look at the issue of grid reliability and cost: the thousands of individuals affected by an aging and vulnerable transmission system. The cost of power blackouts to individuals and the entire economy compared to the crash of an individual system is many times greater than the simple and unrealistic perspective of simple power production costs. Let’s get real here and take a look at the whole picture. You can make your own windmills and get forklift/golfcart batteries for power and save loads on up front cost. The amount the original poster quoted was for pre-manufactured stupidly high priced stuff. You can build a wind generator for around 500 bucks, any DC permanant magnet motor with fan blades mounted on it will work for a generator.The rotor blades are made from 6″ pvc pipe, cut in half, straight on one cut, diagonal on the the other and voila, you have two blades.You will need to supplement that with solr PV panels, but you can go off grid with wood heat, this is the ultimate 3-way power plan, and it works. Just do some online searches , build it and let us know how you turn out. Even if you just wire into part of your panel to power one or two things, hey its worth it! Sounds like you’re on the right path by tackling small energy saving changes first. We had a wood heater as our only source of heat for years. It worked great, though it was a lot of work (good work though, since I enjoyed cutting and splitting my own wood). Besides being a bit dirty, the only other problems we had were distribution of the heat (it tends to stay in the room it’s in), the occasional chimney fire (scary), and what to do in the fall and spring when you just need a little heat. If you already have a central heating system, running the fan on it would solve the distribution problem as well as the spring/fall dilemma. For more info on energy saving changes and other environmentally friendly options, check out our Your Green Home page. I have been looking into off-grid living for about a decade. The cost of solar and wind are too much for me to consider. The main reason for getting off the grid is to get away from utilities that keep raising rates, rates that are getting harder and harder to keep up with. If I can’t afford rate increases, I certainly can’t afford thousands of dollars for equipment to get off the grid. I homeschool my daughter and we have decided to try to produce an effective way of doing laundry without electricity as a science project, and then hanging our clothes out to dry. This is a step towards self sufficiency. We are also planning a garden, perhaps greenhouse project to help lower food costs. I have started researching wood burning stoves for heating as well. Several people I have talked with that do heat with wood burning stoves say they will never go back to heat pumps/forced air heat. They say the heat produced is much warmer and stays warmer longer. I live a short drive from the city and am surrounded by woods. Wood is plentiful. We have already replace light bulbs with flourescents, lowered the thermostat, etc. I have just downloaded a plan for a solar oven that we intend to try out as well – no photovalvics required, just a tires tube, plywood, glass, and a black pot! 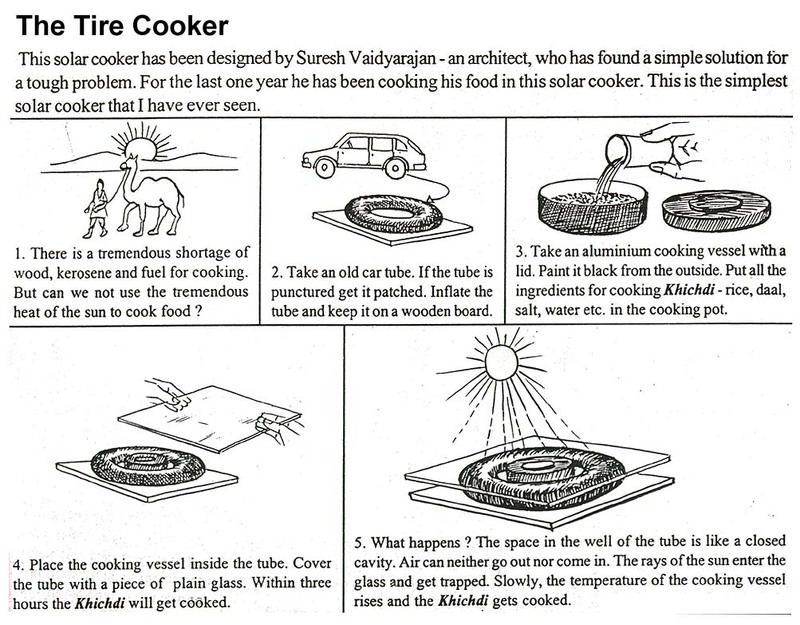 Look at http://solarcooking.org/images/tirecooker.jpg. Thanks for telling me what not to do. I’m still looking for other helpful things and finding them occasionally. I am intrested in learning to build a solar energy that can provide electricity to already built houses in Africa. What materials needed and how to supply the house or property with the solar energy. There is abundant sun almost daily. Victor. Thanks for the great article. Perhaps what you have would be enough in a different climate. In the SW, you’d probably get more bang for your buck on solar panels I’m guessing. For me, personally, a dishwasher isn’t worth it since I have to prewash stuff anyway. As for the dryer, I to hope someday find one with a good enough filter so we can retain the heat rather than venting out without having a lint problem. We downsized to half the space we once had, and honestly, the regular acts of cooking, running the dryer, and so on, keep us warm in NJ, along with good solar orientation. We have insane bills anyway because we are in an apartment that isn’t metered individually, but I know we haven’t run the heater most of the winter. Several homes around here have retro fitted solar panels to exsisting homes, but we have so much less daylight in the winter I don’t think they are independent either. Very interesting site, it is gratifying to know that people are willing to share their experiences for the benefit of others. You can hang your clothes out in -30 F they will dry just as well. The ice crystals turn directly into gas. I have issues with the notion of living a suburban life style while being off grid. It seems to me that the very reasons that would cause most people to be off grid would be the very same reasons that they might want to sort of shrink everything onto a different playing field. For example a much smaller home would be an idea as well as the use of super insulation practices. As far as gas or diesel generators go they will never fail until you really need them. Basic survival may demand having a greater than 30 day supply of wood or some other fail safe fuel. There are a few areas where all help may be shut off for long periods of time in the winter and complex systems could easily cost people their lives. A study of what tribal people did a hundred years or more ago may give one some good ideas on how to scale down and live off the grid.Trying to live as if one is in the suburbs may induce some severe penalties. Going out at night to check generators for example can get you up close with such things as a bull moose or large bear in the wee hours of the night. Uncle B’s diatribe was rather silly, but I think the whole thread is really interesting especially considering the real cost of off grid power. In the end, centralized power stations provide power more efficiently, cleaner and at lower cost than any other. It’s interesting to note that old power plants then called lighting plants rarely were larger than 2KVa which must have been deemed adequate for a home of the day. One could of course use kerosene lamps and then go to bed early. I am helping a friend who is building on an island with no electricity. I read the article, therefore, with great interest until Uncle B’s political, liberal progressive post. Sorry you do not have some sort of filter that would enable this kind of responses to be on a different page…, perhaps the “footsteps of a new world” (sic) page. The great republican depression, now upon us, will force development of realistically efficient refrigeration – Africa uses a solar refrigerator now! Sweden has a solid state DC powered units. LED, DC power lighting systems with no converters to waste power are possible. Super-insulation and solar orientation, as well as ground heat storage have been suggested. Better storage batteries, with designs for the car market are near. Better, DC microwave cooking methods and appliances are possible. Communication by solar powered cell phone systems are already a reality. Expect advances in Compressed Natural Gas technologies to power emergency generators cheaply. Computers already qualify as modern power efficient devices. Off- gridders will have to change lifestyles with the rest of America, and stop trying to mimic on-line decadent lifestyles, and develop their own! The depression will provide a new, realistic, survival based perspective to off-grid. Communal efforts, where one huge windmill with storage facilities may serve a group of homes will make sense as the depression deepens. Newly designed light weight cars getting 50+ mpg will be mandated! The convulsive paradigm shift America will go through, forced upon them by the depression, will vindicate all attempts at off-grid living. We are at the footsteps of a new world and the great republican depression is pushing us ahead. Becoming self-sufficient in food production will be heralded in with GMO’ed, bug proof and fast growing veggies. Zero running cost, zero upkeep homes are technologically possible! The great depression will make them a reality and a necessity for Americans. Smaller self-sufficient, off-grid “Pods” will replace McMansions in the suburbs. Work schedules will give more time off and better commuting arrangements for labor, who will no longer subsidize companies by investing in cars to get to factories! We are up against Mao’s revenge, an endless army of little yellow women, 5’1″ tall, willing to work 24,7, for a bag of rice and a place to sleep on the factory floor! They have proven they can build cars, televisions, computers, anything we can do, they can do cheaper and better! We must exploit this by going off grid and using science and technology to survive! Thi is my first time at this site and it is quite interesting and informative. I would like to put my two cents in for what it is worth if I may. I live in Yucca Arizona where there is ample sunshine and wind most times of the year on 40 acres at 3000 ft ASL. My home is 20 miles from the closest grid connection and I have been living off grid quite comfortably for the past 5 years. It is quite a learning experience to say the least but after working all of the bugs out it is truly amazing the feelings one gets not being connected and dependanton the grid. My home is 1600 sq ft and construction is insulated concrete which has amazing insulating qualities not to mention fire resistance and soundproofing. In being offgrid it is extremely important to do EVERYTHING you can to make the structure energy efficient. My system consists of 12 170 watt PV panels, one small 400 watt wind turbine and 12 250amp hour batteries. I recently added a transformer to step up from 110 volts to 220 volts and I now pump water from my well with my solar system instead of running my propane generator. In my experience having done 12 volt appliances and extremely expensive propane refrigerator that heats the home in the summer time I deccided it to be more cost effective to buy additional solar panels instead of 12 volt appliances. In the early morning prior to the sun coming up my battery bank usualy still has 80 percent left unless of course there are lots of clouds the day before. Living off grid can be a gratifying experience if one plans ahead and takes certain steps to make everything efficient. In response to ELLIOTT’s comments: I would like to have a diesel generator running on biodiesel. However, I don’t know of any biodiesel fuel that will remain liquid when the temperature here in Montana dips to -30F. I have operated conventional diesels in such weather and the fuel heating systems are a real pain. If you know of anyone who is making something to cogenerate electricity from wasted fireplace heat, please post the website for more information. The intent of my article was to address what it costs for what can be done now. I can’t generate power from dreams. In response to Syona: You are correct that a larger battery bank is part of the answer to complete sustainability. In today’s economy, I am having trouble with the $8,000 price tag. I am hoping that the technology for plug-in hybrid electric cars will produce better and cheaper batteries. I would love to have a third source of electric generation. I just don’t know of anything that is currently available to me or most homeowners. In response to darcy: I agree that sustainability is more than technology, and I admit that I am tied to some of my conveniences. When the temperature is -30F, the snow is past your knees and falling horizontally in the wind, that gas (propane) clothes dryer is one of my wife’s favorite indulgences. In response to James Livingwell and Rene: Thanks for the links. In response to everyone, thanks for your interest in a subject we will be seeing a lot more of. If you come across new technology that is actually in production, I am interested. There is a co-generation of heat and power product for homes. Interesting site. Of course, Nanosolar’s printed solar panels will bring the cost of solar panels way down. So far as joe six-pack goes, there are dozens and dozens of ways to reduce your carbon footprint. Check out http://livinggreenlivingwell.com for projects around the house that are inexpensive that pay off big. So far, my natural gas bill went from $125/mo to $79/mo, and my electric (more modestly) went from $125/mo to $110/mo. It’s about your choice of appliances, lightbulbs, double-insulating your hot water tank (with Reflectix and a fiberglass blanket), installing a solar-powered gable vent or roof fan, insulating your garage door, sealing around the windows, installing a high-PSI, low-flow showerheads (so you’re heating less water per shower). Then, with these savings, your can either reduce debt save the money in a high-interest online savings account, so you can affords a solar array or windmill or geothermal. Everyone should do all you can do to reduce your carbon footprint first, then consider generating your own electricity. The rates will drop as demand decreases across the grid as well. i’d like to make the point that sustainability is not all about technology. perhaps it should be seen more in the light of moderating our use of power. it sounds like your house is pretty chockablock with appliances. i think to really make a go at sustainability, we need to forgo nonessential appliances. for instance, where’s the sense in having a dryer run off of solar power when you could just put your clothes out to dry? Thanks for saying what the off-grid evangelists are so careful to gloss over. Every few years, I look at the prices of photovoltaics and associated equipment and compute what it would cost to take my house off-grid. So far, the *interest* on that figure (never mind depreciation) far exceeds what I pay for grid energy. I haven’t even tried to find out what would happen to my homeowner’s insurance premium if I were to install a big storage battery and a gasoline-powered generator in my basement. Would not a larger battery bank allow one to tide over the times when no power was being generated? Presumably, if you had sufficient capacity that your usage couldn’t drain the bank completely until there was some power being generated again, then you wouldn’t have to resort to using a petrol generator with the attendant problems? Or would adding a third source of power, independent of wind and sun, help? P.S. : While I was burning wood in the Fire Place, I would also use the heat generated from the Fire Place, to cogenerate electricity! Hi and thanks for the valuable information. I am planning to put in Solar Power for my home at the beach! But, I will have Edison as a backup at night! I want to go 100% Solar, so I don’t have to be on the Gas Methane Grid at all! If I install a Powered Generator, it would probable be a Bio Diesel Generator, so I could put used Vegetable Oil in it! Also, I would have put in a 4KWH System in place of a 2KWH System, and larger backup Battery Storage, if I lived in Montana, like they do, just to make sure, I had enough extra power! Better to be safe, than sorry! I would also have a Wood Burning Fire Place as well to heat the house, as it gets really cold in Montana! thanks for giving us [OffTheGrid enthusiasts] the benefit of your experiences through your website!